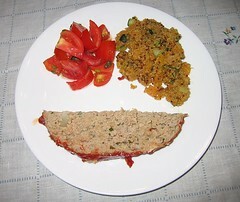 Dinner on 8/11/10: Turkey Meatloaf from Cook's Illustrated's The Best Light Recipe. - Welcome to The City of Desire. Dinner on 8/11/10: Turkey Meatloaf from Cook's Illustrated's The Best Light Recipe. Hee! Cookie Monster! :D That's a great picture! So how does the meatloaf taste? Was the mess and time worth it? The meatloaf really was worth the trouble, because it tasted good and made for great sandwiches the next day (if only I had dill pickles to go with them!). I don't like meatloaf made with all beef or meatloaf mix much, because I think they're too greasy and ground beef always tastes like liver to me. The turkey meatloaf doesn't exactly taste like beef, but it has enough fat in it still that it isn't dry. If you want to try it, I can email you the recipe some time over the weekend. I'd have to do it privately, because otherwise I think that the America's Test Kitchen people would hunt me down.